Learn more about MyNCBI tools and how they collaborate with your eRA Commons account! My NCBI allows you to customize your interactions with PubMed and other NCBI databases. MyNCBI has preferences that you can set to customize your Pubmed experience. The "Outside Tool" preference is important because it tells Pubmed which subscribing institution you belong to. Simply follow these detailed steps to enable the "Outside Tool" preference on your account. When logged in and viewing your My NCBI homepage, you should see a link on the upper-right side of the screen. 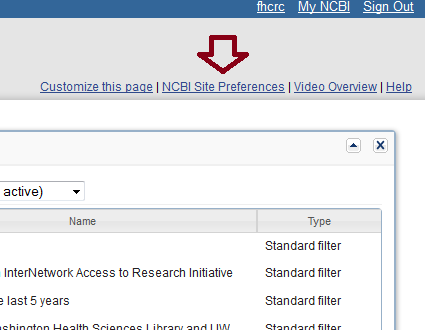 Click on "NCBI Site Preferences." In the section titled, "PubMed Preferences," click on the link for "Outside Tool." An alphabetical list of institutions will display. Choose "F" and click in the circle to the left of Fred Hutchinson to select this as your "Outside Tool" and then click save. This option enables Pubmed to recognize you as a Fred Hutch subscriber even if you didn't access Pubmed from the library's homepage link. As long as you are logged into your MyNCBI account, you will be recognized by PubMed as a Fred Hutch subscriber, even if you are off campus and not on the Hutch network. The "Outside Tool" option provides easier access to Fred Hutch actual subscribed full-text articles via the FHCRC Get Article button, which appears to the right of the generic full-text button. By utilizing the FHCRC Get Article button, you will be assured of accessing the Arnold library online subscription, instead of the publisher site.